Farmersgirl Kitchen: Rhubarb Bakewell Tart and a Giveaway! There is some dispute on line as to whether there is a traditional food to celebrate May Day. However, although some recipes appear, there doesn't seem to be any one dish that defines May Day. I decided that I would try to create a seasonal dish to celebrate May Day and I'd like you to do the same. Applicances Online have agreed to give one of you £30 of Amazon Vouchers for telling me what your May Day Dish would be. Enter using the Rafflecopter widget at the bottom of this post. 1. Make the shortcrust pastry by rubbing the vegetable fat and butter into the flour until it resembles fine breadcrumbs. Add the egg yolks and bring the mixture together. Knead only very lightly, then wrap in clingfilm and chill for at least 20 minutes. 2. Roll out and line a 17cm diameter deep pie tin (the pastry will line two of these tins, you need to double up the fruit and frangipane to fill two though) and put some baking paper inside then fill with baking beans. 3. Blind bake at 200C for 20 - 25 minutes. Remove the beans and paper and bake for a further 5 minutes until the base is baked through and the pastry is golden brown. Leave to cool for 10 minutes. 4. 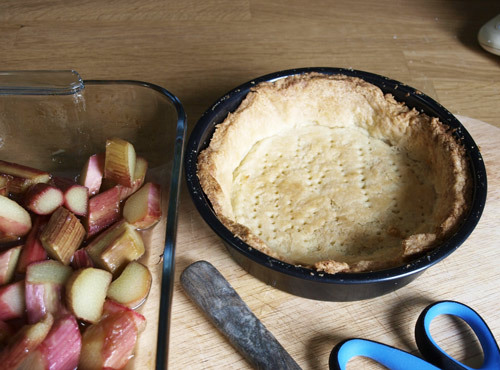 Place the rhubarb and sugar and in a baking dish and place in the oven while the flan is blind baking. Roast until just soft but not mushy. 5. Fill the base of the flan with rhubarb, try not to get too much juice on the base of the flan or it will go soggy. 6. 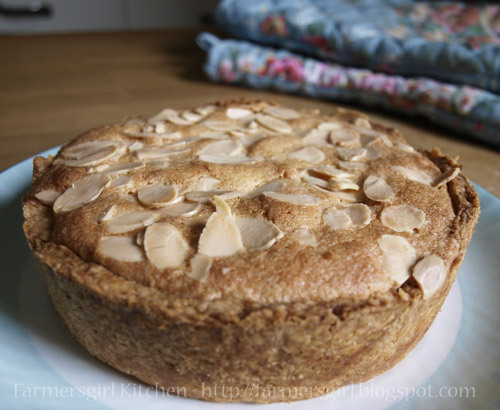 Make the frangipane. Turn the heat down to 170C. Beat all the frangipane ingredients together until well combined and cover the rhubarb with the mixture. Scatter over the flaked almonds. 7. Bake for about 25 minutes until the frangipane is risen and golden. So what would you make to celebrate May Day? Apologies if your comment does not show, it will still be counted through the Rafflecopter widget. I'm having a little bit of trouble with the Google 'no follow' ettiquette! Thanks Emma - I'll do a round up when the comp is finished. Ah Karen - I knew you would have a May Day dish up your sleeve or at least on your blog! Thanks for entering. This looks so delicious, What a great idea and that top photo is fantastic. Better get my thinking cap on! I have an elderflower recipe to try out, if it works that will be a good MayDay celebration blog! Asparagus & goat cheese tart also to make an appearance. 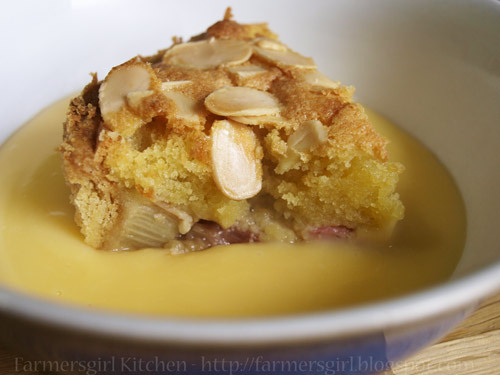 I love rhubarb and yours looks fab, another one to try! It would have to be rhubarb and custard cupcakes. A lemon drizzle cake, as it is such a sunny cake. Really lovely idea. 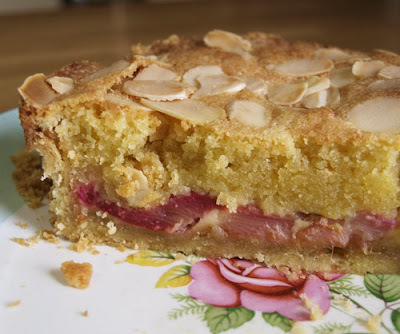 I will definitely be giving your Rhubarb Bakewell a go. I do one with fresh raspberries at the bottom but Rhubarb would be just as good. Lovely recipe! Yum yum yum. I can't think of a British traditional recipe for May Day but how about a Finnish recipe Tippaleivät which are like a sweet doughnutty type snack.